During this week and through the weekend the Festival of San Clemente is going on. Every evening during the week until Thursday night starting at 8pm Mass will be offered next to the Virgin statue in centro. Different neighborhoods sponsor these Masses and refreshments supplied by the neighborhood will follow the service. Thursday night is a cultural event with local talent supplying the entertainment starting at 8pm. 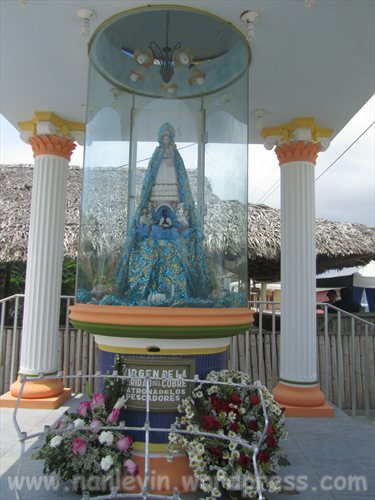 Saturday finds the community participating in a boat parade at 9am starting at Vivianas Restaurant with a procession through the town Saturday morning at 10am carrying the Virgin to the church. At 11am a free gastronomic festival sponsored by the Godparents with various stands supplying food. 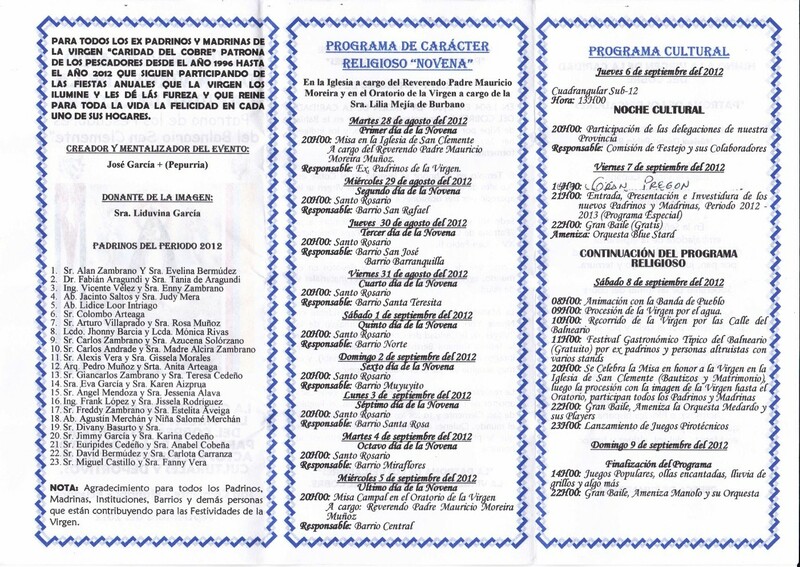 8pm Grand Mass Saturday evening in the Church of San Clemente where baptisms and weddings will be performed. A parade returning the Virgin from the church to the main street shrine will process after Mass with a dance at 10 pm with a free orchestra. 11pm is the spectacular fireworks display. Sunday at 2pm games will be offered and dancing starting at 10pm. This is an annual festival packed with fun for everyone. 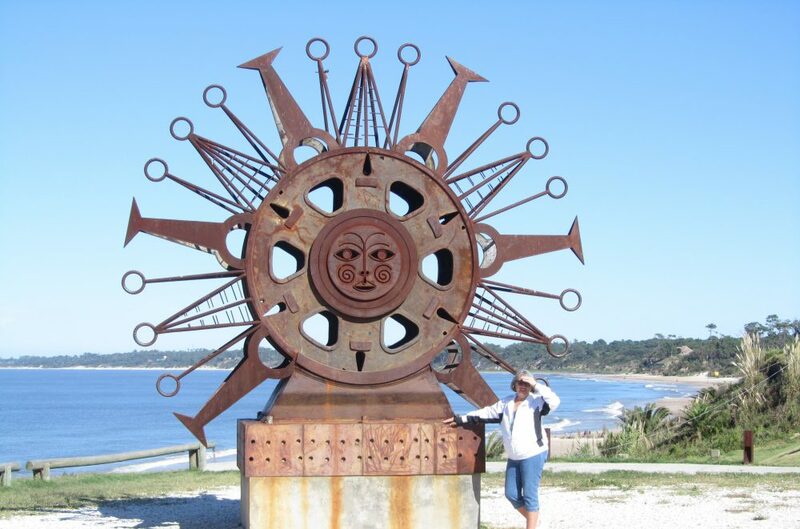 This entry was posted in Ecuador, Festivals, Food, Parade, San Clemente and tagged Beach living, boat parade, Ecuador, Expats, gastronomic festival, San Clemente, South American, spectacular fireworks by Nancy Levin. Bookmark the permalink. 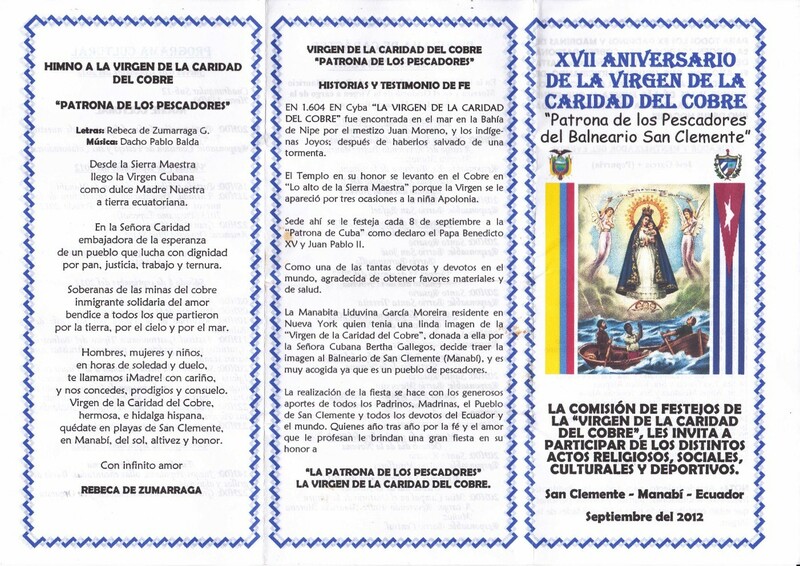 What a wonderful honor to La Caridad Del Cobre. My favorite virgin. Oh Nancy I thank you from the bottom of my heart for the prayer, I just printed it out, you are always so thoughtful! Thank You, Thank You!